Simran and Seva : These are the Foundation of Sikhism. It is the duty of every Sikh to practive Naam Simran daily and engage in Seva whenever there is a possibility - in Gurdwara; in commumity centre; old people's homes; care centres ; major world disasters, etc. The Holy trinity of Sikhism : Guru Nanak formalised these three important aspects of Sikhism. Naam Japna : A Sikh is to engage in a daily parcitce of meditation and Nitnem by reciting and chanting of God's Name. Kirat Karni : To live honestly and earn by ones physical and mental effort while accepting God's gifts and blessings. A Sikh has to live as a houesholder carrying out his or her duties and responsibilites to the full. Vand Chakna : The Sikhs are asked to share their wealth within the community and outside by giving Dasvand and practising charity ( Daan) .To "share and consume together". Kill the five Thieves : The Sikh Gurus tell us that our mind and spirit are constantly being attacked by the Five Evils - Kam (Lust), Krodh (Rage), Lobh (Greed), Moh (Attachment) and Ahankar (Ego). A Sikh needs to constantly attck and overcome these five vices. Positive Human Qualities : The sikh gurus taught the sikhs to develop and harness positive human qualities which laed the soul closer to god and away from evil. These are: Sat (Truth); Daya (Compassion); Santokh (Contenment); Nimrata (Humility); and Pyare (Love). 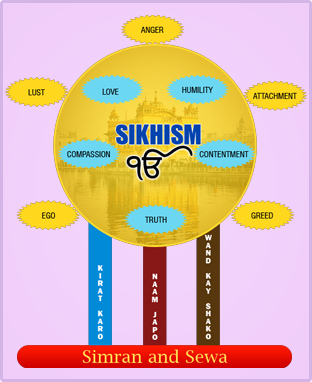 Diagram showing some of the important sikh beliefs. Energy is the Creator of the Universe. All human beings are equal people of all religions and races are welcome in sikh Gurdwaras women have equal status with men in religious services and ceremonies. The human life is supreme and it is through this life that we can achieve oneness with god's will.finding god in this life and living by his commands helps us to attain god's mercy. » there is one creator. » whose name is truth. » timeless whose spirit is throughout the universe beyond the cycle of death and rebirth. » by the grace of the guru. » God is the made known to humanity. » chant and meditate on his name true in the beginning,true now, and says Guru Nanak, will be true forever.